"I always guarantee my clients one thing - no one will work with more diligence or determination in representing you. Over the past 35 years, I have been a strong advocate for my clients both in and out of the courtroom. I would consider it a privilege to represent you." 1973, Pennsylvania; U.S. Court of Appeals, Third Circuit; U.S. District Court, Middle and Eastern Districts of Pennsylvania; All trial and appellant state courts in Pennsylvania. Georgetown University, J.D. 1973 / Fordham University, B.S. 1970. Recipient, Distinguished Service Award; Trial Attorney,Department of Justice, Antitrust Division, 1973; Assistant U.S. Attorney, Middle District of Pennsylvania, 1974-1979; Special Assistant, Eastern District of Pennsylvania, 1979-1980; Chief Judge Emeritus, Court of Judicial Conduct, Pennsylvania. 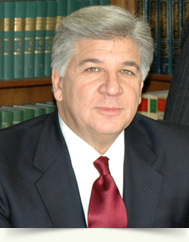 (2000-2004); Member, Disciplinary Board, Supreme Court of Pennsylvania (2006 to present); Listed in: Pennsylvania Super Lawyers, Philadelphia Magazine;AV® Preeminent™ Peer Review Rated by Martindale-Hubbell®, denoting the highest level of legal expertise and the highest ethical standards as determined by the bar and the judiciary. Also Member of Foley, Cognetti, Cimini, & Cummins (1980 to 2012).